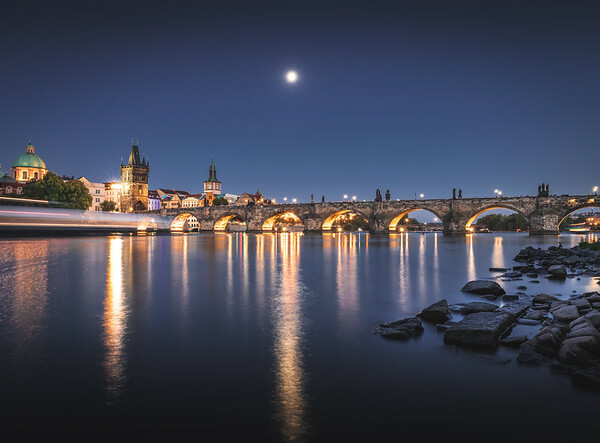 Shot on a clear summer evening in Prague as the moon rose over the famous Charles Bridge. We were wandering the streets of Prague on our way to the Charles Bridge when we saw this narrow street heading right to the river bank. The place provided a perfect view of the bridge with some rocks to use as the foreground and the moon rising in the background to create this magnificent scene. 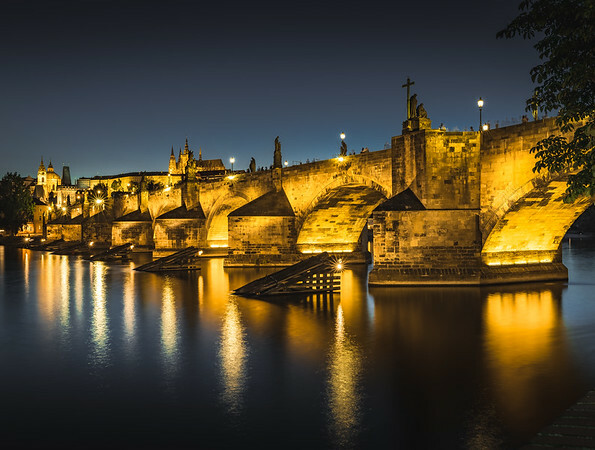 Charles Bridge is a historic bridge that crosses the Vltava river in Prague, Czech Republic. 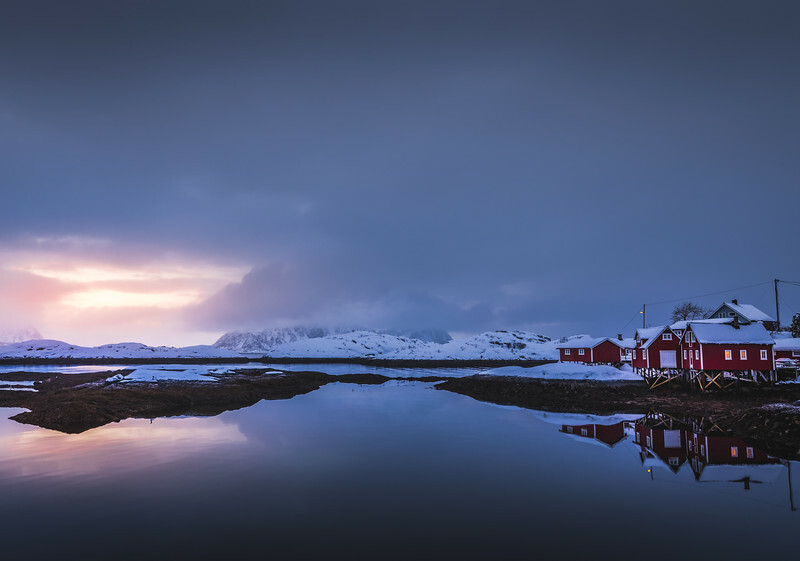 Its construction started in 1357 and finished in the beginning of the 15th century. 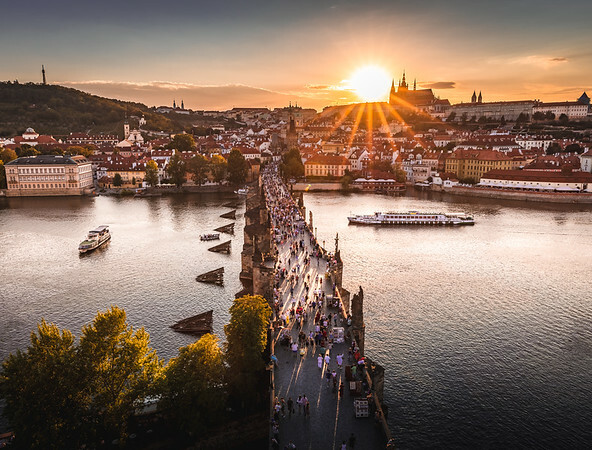 A view of Charles Bridge and the evening rush on it with Prague Castle in the background and the sun setting behind it. We were walking on the bridge and looking for a good spot to shoot the bridge in sunset. There were a few good spots but the hordes of tourists (us included) were just ruining the composition. Then we noticed that it was possible to climb up the tower on the end of the bridge and luckily it was still open. We rushed to get tickets and almost ran up the stairs to get this view before the sun disappeared behind the skyline. Shot taken from the restaurant right next to the bridge where we had dinner on our last night in Prague. You can see the Prague castle in the background. The bridge is 621 metres long and nearly 10 metres wide. It is decorated by a continuous alley of 30 statues and statuaries, most of them baroque-style, originally erected around 1700 but now all replaced by replicas. They depict various saints and patron saints venerated at that time. The most prominent Bohemian sculptors of the time took part in decorating the bridge, such as Matthias Braun, Jan Brokoff, and his sons Michael Joseph and Ferdinand Maxmilian. 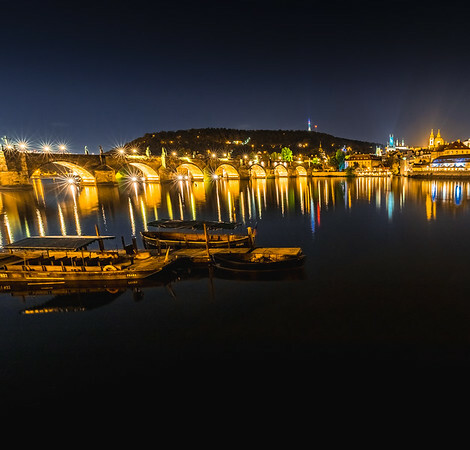 Boats docked for the night near the famous Charles Bridge in Prague. There is a lot of boat activity in the Vltava river during the day. Boats of all shapes and sizes fill the river, ranging from small paddle boats to huge steam boats. These small old wooden boats are both a good way to see the city from the rives and a treat for the eyes.